pianoSonoma arrives at the Green Music Center this summer with approximately 20 participants, 15 Yamaha pianos, and 9 conservatory artists. The small chamber music festival features workshop-style lessons and rehearsals, events at exclusive boutique vineyards, and most notably, two concerts at Weill Hall, Sundays at 3PM on July 27 and August 3. But if concertgoers are expecting standard classical fare from this Juilliard crowd of musicians, prepare to be surprised. pianoSonoma’s ambitious program creates a dazzling musical menu unlike anything the audience has ever tasted. With the exquisite musicality of pianoSonoma faculty Jessica and Michael Shinn along with some of the nation’s leading young artists, including cellist Julian Schwarz and pianist David Aladashvili, generous helpings of the classical chamber music canon—the Mendelssohn Trio, Franck Violin Sonata, and Ravel Tzigane—will be sprinkled with the robust flavors of new music by New York-based composer Thomas Cabaniss and pianoSonoma’s first Composer-in-Residence Paul Frucht. Violinist Yevgeny Kutik, fresh from a much anticipated album release of treasured pieces his mother brought when his family emigrated from the former Soviet Union, brings an unparalleled poignancy to Prokofiev’s Cinderella. And crossover artists Charles Yang, violin, and Peter Dugan, pianist, add a spice to improvisation that is as tantalizing as it is thrilling. 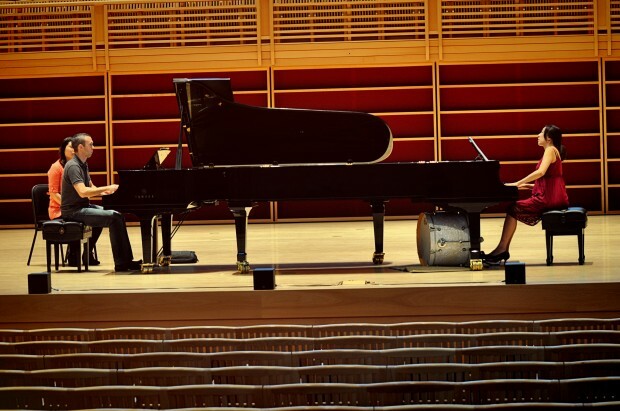 With its extraordinary performers and uniquely crafted programs, pianoSonoma’s summer concerts are sure to leave ticket holders coming back for seconds.